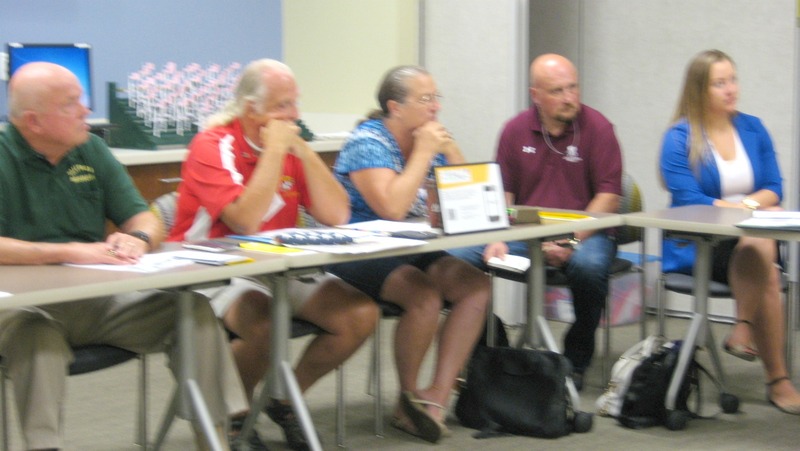 Our June 26th meeting was an incredible sharing of veteran support services. 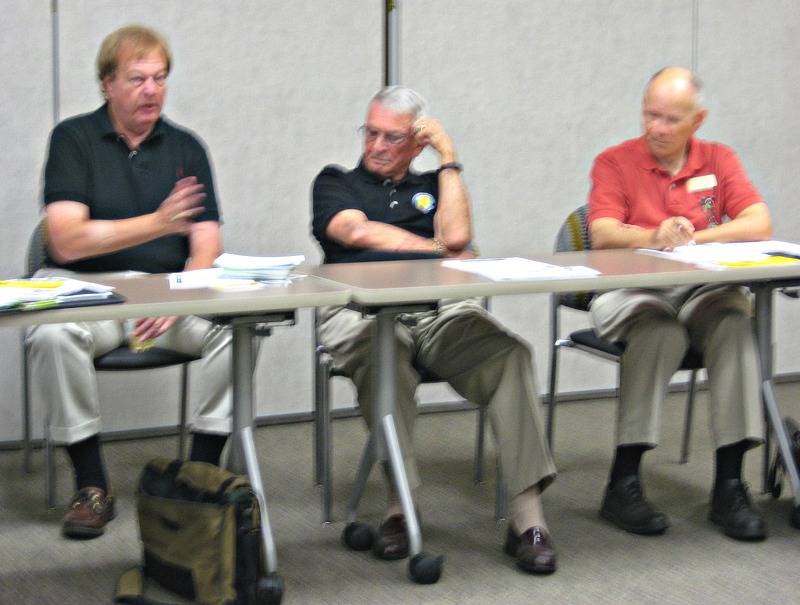 If you were not able to attend our June 26 meeting, you missed an exceptional interchange on veterans and services for them. Each of the 22 participants shared their experiences and perspectives. Some were veterans from Vietnam, Iraq, or Afghanistan, and Joseph who is based at Mayport is still actively serving. We heard from a variety of organizations that support veterans. Marianne from Hope Therapy uses equine exercises to help veterans who are dealing with PTSD. Chris, one of the veterans who has benefited from her program, now runs a nonprofit Under The Rainbow Ranch with a goal of helping veterans reintegrate into civilian life. Maureen who heads the Clay County Writers group told us about a 2-hour program that helps those dealing with stress to get relief by expressing their emotions in writing. Allie of Big Brothers/Big Sisters highlighted how veterans can be mentors to young people and how that interaction benefits both. David from the Penney Retirement Community shared how 100 out of 500 residents are veterans and the many things that the organization does to recognize them. Each veteran prepares a profile of their service which is added to a binder. Jennifer from the Arthritis Foundation spoke about her group’s assistance to veterans. Art and Jenny of Heritage Guides invited us to join the Parade of Flags at the Penney Retirement Community on July 4th. Heritage Guides does tours, storytelling, and veteran tributes throughout Clay County. Callan from the YMCA’s Take Stock in Children program spoke about the affect of deployment on children and what they do to help. Dee has many family members in the military (wife, mother, grandmother) and does outreach to politicians in Washington D.C. on behalf of veterans. Paul from the Vietnam Veterans of America raised the issue of suicides among the military. He spoke about the rejection faced by the Vietnam Veterans when they returned home. He suggested that today we say to them “Thank you for your service, welcome home”, a welcome that they didn’t receive decades ago. Rose from Veterans Services highlighted the many services they provide including assistance in filing for educational benefits, VA home loan certificates, medical treatment, and service connected compensation. Mitzi of Community Hospice spoke about the services that they provide to veterans and others. Gary from Vietnam Veterans of America spoke about working with veterans who have ended up in prison and getting them homes and job ready when they get out. Rescue dogs are trained by the prisoners to become therapy dogs for those in need outside the prison. Jerry from Career Source spoke about the many career services that his organization provides to veterans. Herb was there from the Military Museum reminding us of the benefits of a visit to his museum. Sandy, a member of the Orange Park Friends of the Library was there to find out what veteran services were available in the county so she could share this information with others. Sylvia spoke about her gratitude as someone from Trinidad who has experienced the great works of the U.S. military. Carla who is running for Clay County School Board in 2016 and is an elementary school teacher shared her vision for providing support to students when their parents are deployed. Of course Doug, Samantha, and I were there to add to the discussion. There was a suggestion that Shaping Clay organize a speaker’s bureau of people who have stories to share in the community, not just about veterans, but about seniors, health, etc. This is an idea that the group will explore. Doug suggested that we revisit the topic of veterans at the beginning of 2016. Of Clay County’s approximately 200,000 people, some 30,000 are veterans. Any suggestions for how we can keep connected to share resources and services for veterans before we meet again would be welcomed. At our May 29th meeting we took a road trip to CJ Acres Animal Rescue Farm. For those that attended this meeting it was exciting and memorable. Lee Sackett, Executive Director and owner of the farm provided meeting space in his barn and shared about his organization’s ongoing efforts to rescue, rehabilitate, and reintroduce animals suffering from abuse, abandonment, neglect or catastrophic disasters. Some of the present residents include cows, horses, goats, pigs, turkeys, ducks and even a few cats. Lee gave the history of his farm as well as the stories of the animals who reside there, and he brought to our attention some of the obstacles that CJ Acres faces such as not being able to pick up food and supply donations. We toured the facility and had the privilege of interacting with the animals. Linda Welzant, Executive Director of Clay Humane shared information about the many services that they provide. A team of veterinaries staff a low cost clinic and provide free cat spay / neuter services, low cost vaccinations, and microchipping. In addition their education programs stress the prevention of cruelty to animals and annually sponsor a poster contest for all 5th grade students in the county with a theme of animal overpopulation. They also educate about disaster preparation to include your pet and the benefits of adopting, not shopping, when looking for a pet. Their pet therapy volunteers visit nursing homes. Clay Humane also responds to wildlife issues and is a place to report animal cruelty. Visit the websites and ‘like’ the Facebook pages for these 2 great Clay County nonprofit organizations. 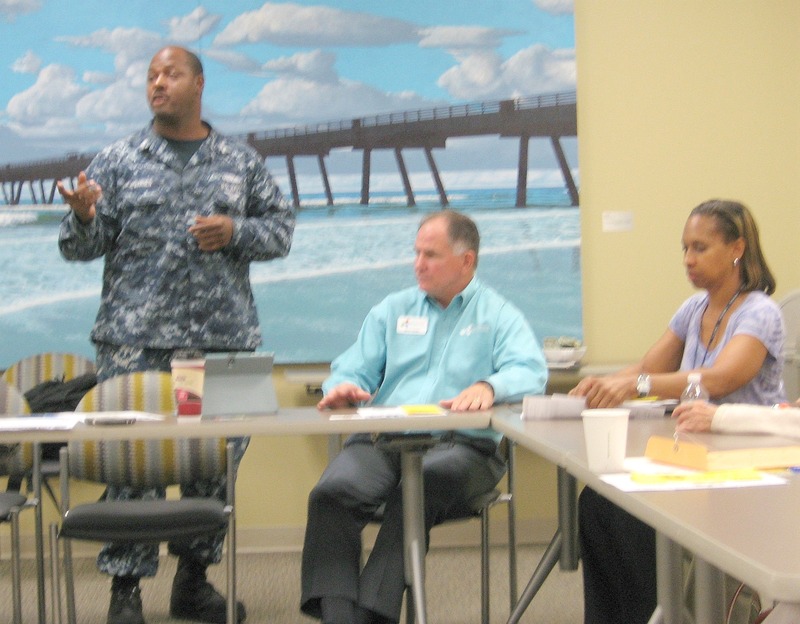 At our April 24th meeting, we shared effective marketing strategies and tactics. As you review the suggestions below, which approaches are you already using? Are there one or two areas that you would like to work on incorporating within your organization? Are there things your organization is doing that you’d like to have us add to the list of suggestions? First know your market and honestly evaluate what you are doing to reach that market. Make sure that you are offering a quality product or service that is supported by excellent customer service in a culture or way which is comfortable for your prospects / clients. By doing this, and following up, your efforts will generate referrals. Ask for referrals from satisfied clients. Get out in the community and cultivate relationships; don’t wait for people to come to you. What is your online presence? When people come to your website or Facebook page can they figure out how you can help them in less than 7 seconds? They are not coming to watch a 10 minute video. People are searching because they have a question or want to solve a problem. If your organization has multiple audiences, then you probably need multiple elevator pitches. Each elevator pitch should be appropriate for the target audience and should be easy to understand. Create a jingle, song, or catch phrase to make your marketing more memorable. Integrate humor and make your message lighthearted when appropriate. Integrate multiple senses – auditory, visual, tactile, and / or olfactory. Go where your target population hangs out which could be clothing stores, nail salons, or places for kids. Have someone who has gone through your program return to share their success. Use these positive stories to build confidence with prospects. Give past and present participants your cards to pass out. Prepare marketing flyers or other materials that you can hand out or leave behind after a meeting. Gauge the different modes of reaching people to obtain the best results. Where will your marketing message resonate – at schools, churches, social media, at the mall? Can you best reach your audience via text, email, or phone? Find ways to celebrate and salute accomplishments. Follow through after events. One way could be by telling stories. Don’t forget to market within your own agency, especially if you have multiple programs. 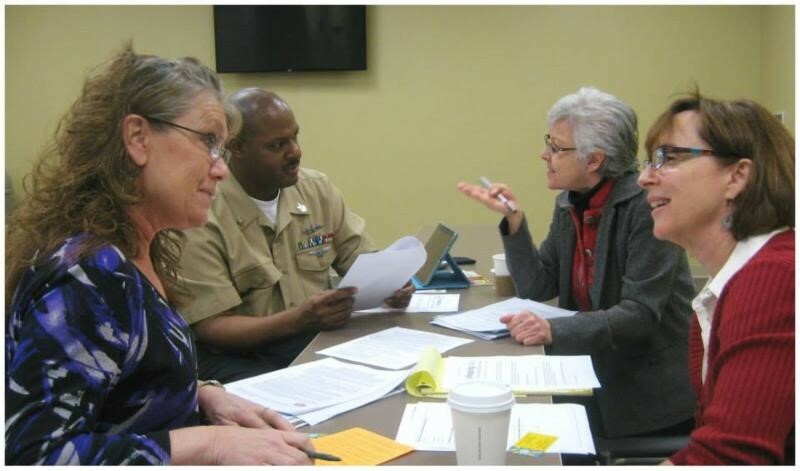 At our March 27th meeting we explored fundraising tips – do’s and don’ts. 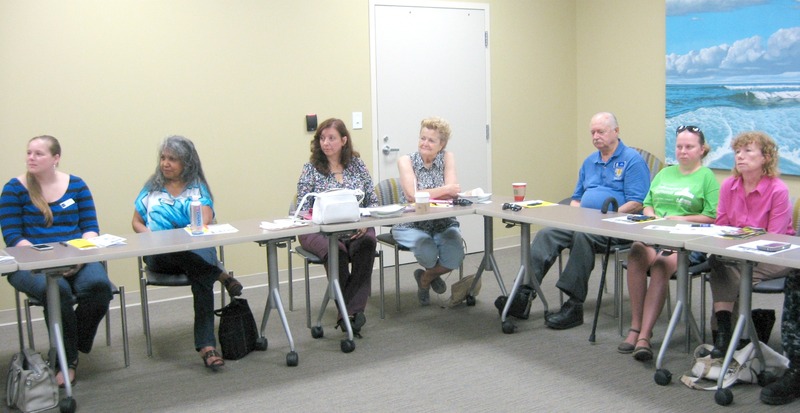 Each member took a moment to share what they learned about another organization by having a one-on-one with other community leaders or Shaping Clay members since the last meeting. For those that didn’t have a one-on-one meeting during the month, he or she shared a surprising thing about his or her organization, something we may not know about. The topic of fundraising had a stellar introduction from Lee Sacket with CJ Acres Animal Rescue Farm and Allie Munch with Big Brothers Big Sisters of Northeast Florida. Thank you to both of these community leaders for taking the time to share their wealth of knowledge with the group. Some general suggestions were to have everyone prepared before the fundraising effort and make it fun. Know your organization, your story, and your organization’s needs. What is your mission, vision, current goal(s)? How did you start? What do you physically do? How do you impact the community? What are your successes? What do you currently need (monetary and non-monetary)? Who do you know? It’s important to continually nourish relationships. Get your name AND face out there! You are part of your organization’s mobile branding. Be involved, make connections, share resources, volunteer and serve. In-person contact is invaluable! Set coffee dates, lunches, and after hours informal meetings. Gain trust and confidence before making a big “ask”; Build friends before building funds. Identify the ways we can connect with contributors, not everyone will give cash. We all need more than just money! Individuals can give money, time (volunteerism), skills, and services. Small businesses can give in-kind donations, goods/services, small sponsorships. Large corporations can give large scale donations and sponsorships, employee involvement, and publicity. Make giving easy! Involve more people with fun and creative activities! Use fundraising approaches such as “friendraising”. Have a planned small, 20 minute talk about your passion, and ask if the person knows anyone who you should meet or could help. They may even raise their hand to support your effort. Don’t be boring or predictable. Have a signature event with flare that people can talk about and share. Make it special and exciting, something people really want to attend or support. When asking for donations, follow up and follow through. 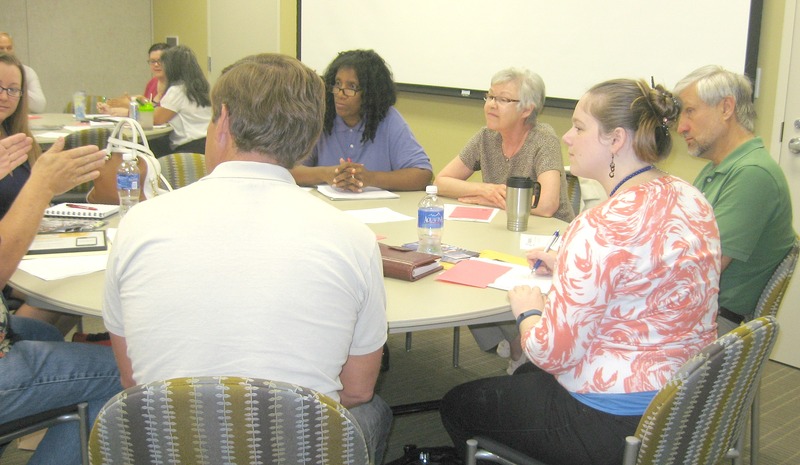 Partner with the community and meet with people who have experience in event planning or fundraising. Make sure that your event is consistent with your mission. In Lee’s case he wouldn’t serve meats (hamburgers / hot dogs) since he rescues cows and pigs at his farm. Don’t say we “need”, rather look for support. Every word matters in the mission and vision statements, so stay simple and clear. Someone asked, “Is there a fundraising season?” It depends, there are key times to host an event such as with a holiday. Do not conflict with other major events which could limit turn out. Pick a date that can be anchored for longevity and give yourself ample time to plan the event. The theme of our February 27th meeting was networking. We explored ways that each of our organizations network with their constituents and with other organizations in the community. Welcome to the several new people who joined us! Each organization had an opportunity to share a success story representing the lives that his or her agency has touched. 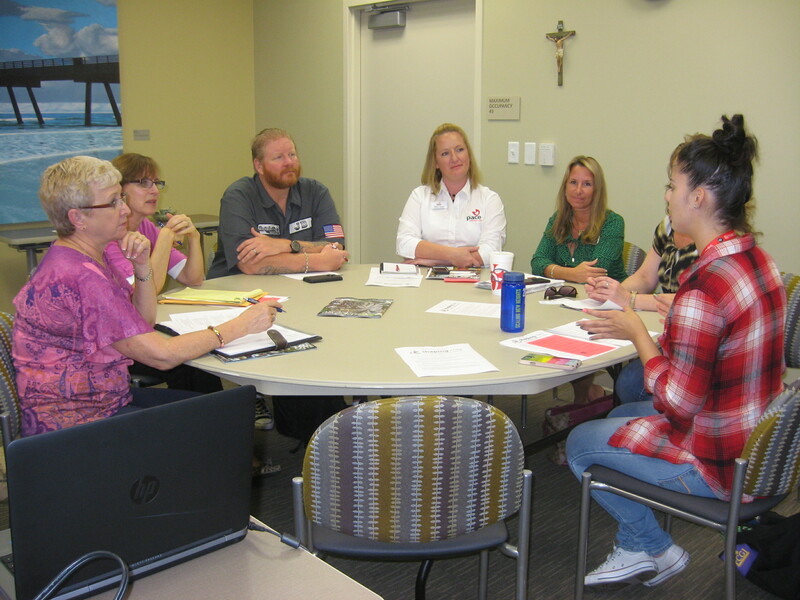 It gave us all a deeper look into the heart of our Clay County nonprofits and community. 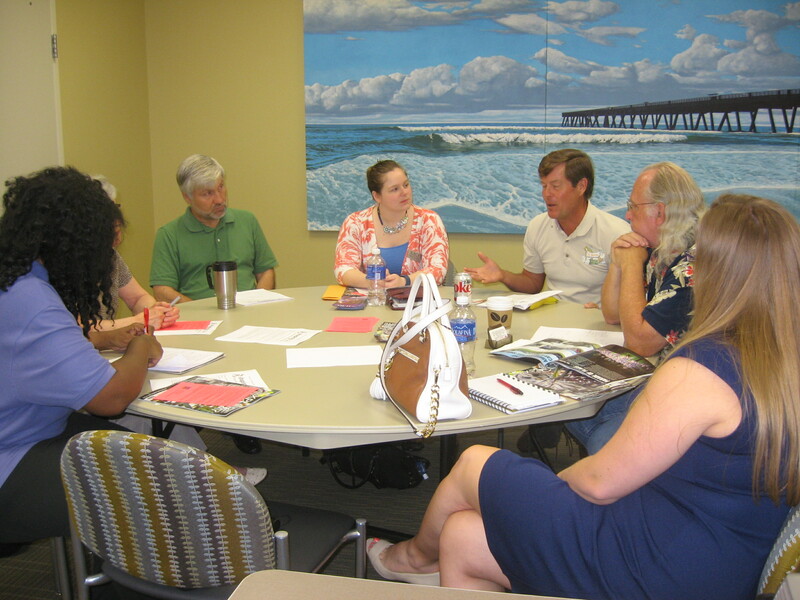 One networking suggestion was to attend Clay County Chamber of Commerce events which are open to everyone. The Chamber sponsors many networking events throughout each month. If you haven’t already attended, try out Finally Friday meetings. Here you can get your message out to 60 – 90 attendees each week. No need to preregister; just come prepared with a 30-second statement including your name, organization, and what you are looking for. The meeting starts promptly every Friday morning at 8:30am at Haven Hospice. Another idea was for nonprofits to reach out to for profit companies. Many companies are looking for ways to contribute to the community. They may not be aware of your organization, who you are reaching, and what successes you are having. Find ways to get your story out and meet with representatives from companies that you’d like to have support you. Build face-to-face relationships. Have one-to-one meetings over coffee with people from other organizations (profit and nonprofit). Find out more about what each other is doing and explore if there are ways to collaborate. Make sure to follow up and stay connected after an initial meeting, follow up is key to successful relationships. Stay current with other events going on in the community. By doing this you may identify opportunities to support each other. When possible, attend events being held by other organizations. In building your board reach outside your normal boundaries to those who may not be directly related to the mission of your organization. You want people that through his or her network can make connections to individuals and groups that want to support what you are doing. Connect our organizations via Facebook. The more active we are using social media, the more we will get our story out and get supported. Consider not just posting an upcoming event, but share photos and information about what happened during and after the event. Shaping Clay is a network of Clay County nonprofits, and we welcome any community stakeholders to our meetings who would like to contribute to the discussion or find out what is going on. At our January 29, 2016 meeting we are going to review the CHIP (Clay Health Improvement Plan) implementation plan introduced earlier in January. Workgroups are being formed for each health issue that was identified as high priority in Clay County: Mental Health, Unhealthy Lifestyle/Prevention, and Healthcare Access. 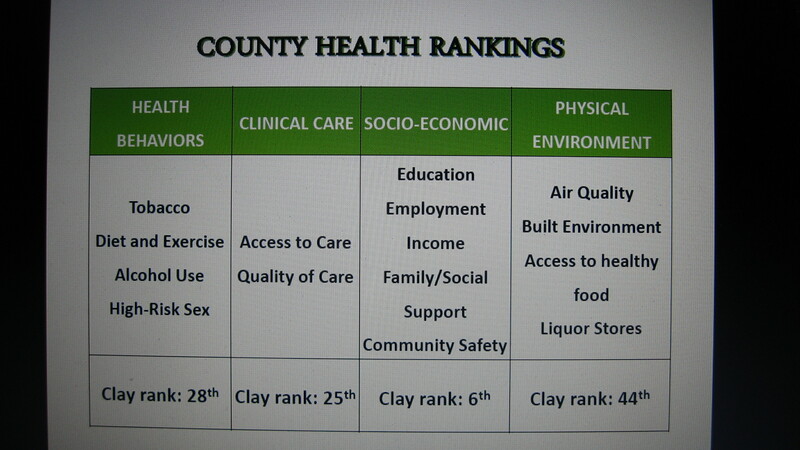 We will explore how organizations affiliated with Shaping Clay can contribute to this county-wide effort to improve the health of Clay residents. Out of 67 counties in Florida, here’s where Clay County ranks. Please join us at St. Vincent’s in Clay County. Plan to arrive by 8:15 to purchase your own coffee at the St. Vincent’s cafe, then walk down the hall to the meeting. Our meetings are from 8:30 – 10:30 a.m. Meeting notes from our prior discussions appear below.